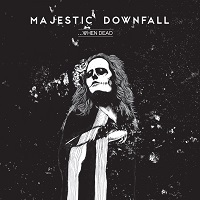 MAJESTIC DOWNFALL, a Mexico based Death/Doom band, have been putting out great music for almost a decade. Founded and masterminded by Jacobo Cordova in 2006, the band already has a slew of excellent records under their belt, from their debut demo through to their previous three full-length albums. The duos latest offering, "…When Dead", however, might just be their breakthrough album. After nine years, the band has begun to hit its stride, and this new record stands as perhaps their best and most interesting. After the short, introductory title track, "Escape My Thought" practically bursts out of the speakers in a blaze of vicious, Blackened fury. For a genre that is known for being slow and brooding, it's strange to hear a band effectively open a record of this kind with speed and aggression. This quickly gives way to distorted, dirge-like riffs and some deep gutturals. It's a very powerful track from start to finish, with literally dozens of hooks, both vocally and on guitar. The Doom and Death Metal elements in the music are very well balanced, rather than one taking precedence in the mix. This alone sets this track apart from the music of other contemporary Death/Doom bands. It practically ebbs and flows between much harsher, visceral sounds through to dark, melodic leads throughout the track, meaning that no idea becomes stagnant or drawn out. Then we reach one of this album’s more impressive offerings, the dark and monolithic "The Brick, The Concrete", a song built around crushing riffs and vicious vocals. In between the much thicker, distorted tones, cleaner tones are added to great effect, making some sections in this song sound really interesting and varied. This, coupled with an impassioned solo, really makes this track one of the highlights of the record. The records penultimate track, "Doors", is a dark, dissonant track that utilizes a lot of distorted guitar tones very well. The guitar lines have a melodic side to them, whilst still maintaining a level of heaviness and depth, especially in the vocals. The final track on the record, "The Rain of the Dead", is a suitably miserable funeral dirge, which wraps this record up very nicely. The shift between sharp, melodic riffs and much more heavily distorted ones, make this another stand out track. This is a solid record with plenty of really cool ideas on it from a band that is clearly very talented. This slots very well into the rest of their catalogue, and contains plenty of music, which will most likely set a new benchmark for their future records. This should definitely be on every Death/Doom fans list of bands and records to check out.